[EDIT: Yeah..I sorta forgot a subject/title line *headdesk* Which means WordPress grabbed the first line…] Time just keeps marching inexorably along, doesn’t it? Ah, well. How was your weekend? Mine…was. It’s never long enough, which is weird because I work most weekends. 🙄 What should it matter, right? I discovered that the first three chapters for the proposal for COWGIRLS SWEETHEART aren’t the first three chapters at all. So…more work. I also figured out I really hate writing a synopsis for a book I haven’t written yet. I don’t write linearly and writing a synopsis is too much like doing an outline. *shudder* Ah well. I shall persevere. The family celebrated Baseball Boy’s birthday at Toby Keith’s I Love This Bar and Grill. Giant chicken-fried steaks. And cheese fries. Yeah, no dinner for me! We got to see (and HOLD!) Bean Sprout. He slept through lunch. He’s such a goo’ boy! Oh, and I discovered a new-to-me author. I should not read blogs listing ebooks on sale. I found one where the blurb intrigued me. It was .99 so why not? I mean, it’s not like I don’t have 5 books to read for contests or already have 100+ books on the TBR pile. Nope. Had to go buy a new one. And then get stuck in a long checkout line. Without the contest book I’m reading. So what did I do? I pulled up that 99 center on my iPhone. And couldn’t frickin’ put the book down. Grrrr. And then downloaded the second book and had to read it. Instead of working. Or read contest books. *headdesk* The author is Dannika Dark and the book is SEVEN YEARS. It’s about Shifters. She’s funny but knows how to be dark. I’ll have quotes on Wednesday. Today, I HAVE to get SWEETHEART sorted out. I have to hide my Kindle. And at some point, I should consider doing housework…or not. Who had fun and what do you have planned for the week? This entry was posted in Writing Life and tagged books, business, family, Iffy, lolpic, Monday, reading, writing. Bookmark the permalink. Just ordered Seven Years and Six months for tablet, with what I have starting on Friday buying E books should not be one of them. If everything keeps going forward, I should close on the new house 4/11!!! Then the fun begins!! OH KIMBER!!!! That’s awesome news. Congrats! I’m so happy for you. And yes, you should have ebooks to read when you rest between spurts of packing, moving, and unpacking! *nods* Yup-yup. I went to JR Ward’s Q&A session in Cincy over the weekend. Nothing like spending an entire day with other readers. It was mega awesome and if you read the BDB series, I have posted my Q&A wrap up on my blog already. Have my first 5K since my foot surgery this weekend, so am trying to to freak out too much. My foot has decided it wants to swell again for some reason this week. No, no bad foot! You must cooperate with Liza so she can run! I’m proud of you for training and getting out there to run it. Okay, I have no idea how I missed this on Monday. I think Monday somehow oozed onto Tuesday a bit. Janet missed it too. Who knows? 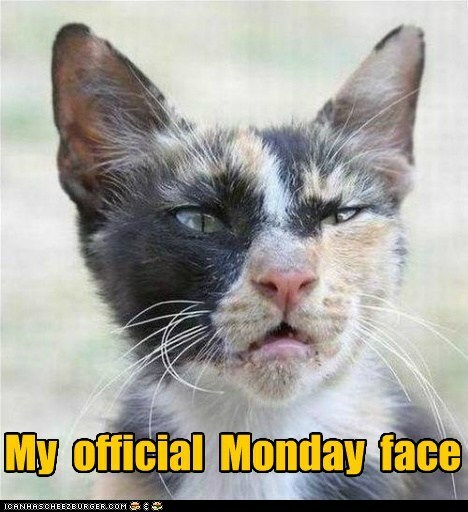 It was Monday! 😆 I’m glad ED is there fixing the wiring. No fun when things go POP-FIZZ-SIZZLE. If you get your brain on line, let me know how you did it. I’m not having much luck with mine either.